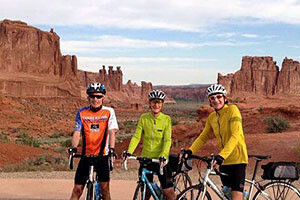 We offer two types of rides, featuring camping & inn lodging. Trips range from 5 or 6 nights, and include everything you need except personal clothing & personal affects. 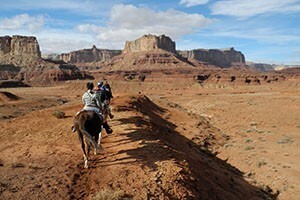 There are several tour companies in the Moab area that offer guided trips on quarter horses. Others combine raft trips with one or two-night horse pack trips. If you arrive with your own stock you can choose from a variety of trails including Seven Mile Canyon, Pack Creek Trail, Red Rock Horse Trail, and others which snake through classic Old West landscapes, ranging from desert canyons to forested mountains. 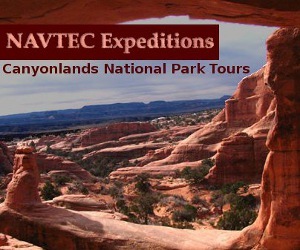 Canyonlands National Park is ideally suited for exploring some of the park's more remote areas like the Maze and Orange Cliffs from a saddle. There are no commercial outfitters in the park, so you must transport your own stock. Due to limited water within Canyonlands you should contact the park at (435) 719-2313 for recommendations on where to ride. Keep in mind that backcountry permits are required and you must adhere to all regulations which includes the use of pelletized feed.